This Bible verse is so famous that everyone of us should know by heart. Use the key words to form a six-letter word that best explains it. We are born, we take our journey and we all have different path to take but we all have one destination but the important part is being able to make the journey matter towards the end destination. Sir Franc, I thought you're the very first person to solve the MYSTERY WORD but I guess I wasn't able to effectively relay the message and you noticed only the poem I made to emphasize my point. Thanks for the very heartwarming poem/verses you shared here. Salamat! 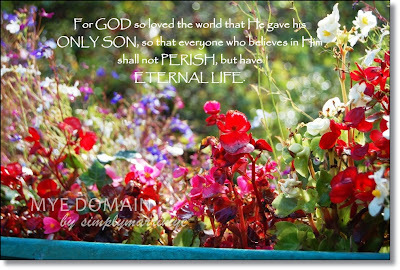 John 3:16 is my favorite bible verse. Yes, things must be done not to please other people but to please HIM. I may not have a pure heart but I always think of HIM every time I have to make decisions and ask myself if it's pleasing in God's eyes. Yup, John 3:16 is indeed a very popular verse. It's so popular that even professional wrestlers like Steve Austin uses it. Of course, instead of John he uses his own name, Austin 3:16, although I have no idea what it means. When it comes to presenting your ideas poems, you;re one of the best. 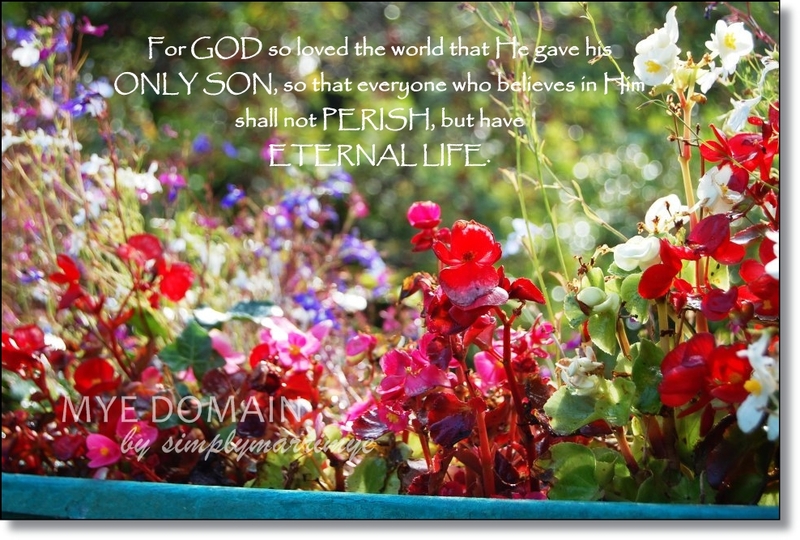 John 3:16, I admit, is the only Bible verse that I remember, but this small sentence embodies my faith. Whenever I have doubts or losing my faith, I always think of this verse. God, indeed, loves the world. i always read verses in the bible, faith is something we should not lose, let's always give praise and thanks to the Lord - God Speed! Now I remember World Youth Day! Thanks for the inspiration. This post is refreshing. John 3:16... Hmm... I'm ashamed to say I haven't picked up the Bible in a long time. :( Must get back to reading it. I love this verse. I think this is the only bible verse that I know that I have memorized by heart. As long as we have our faith nothing is impossible. God will always be there to guide and protect us. A very popular verse but often neglected. I guess, it a high time to love and honor they father. Hmmm... This post got me thinking, honestly.. Not sure why but my full attention was with the thoughts that you got behind this poem. One of my favorite verse from the Bible because it encompasses everything. We shall always keep in mind that whatever is happening in our daily life, good or bad GOD is always with us. I believe this is the GOSPEL that tells us the good news about Jesus Christ. Powerful verse for an empowered life. Keeps me grounded, thanks for sharing. agree, one of the most famous amongst the bible verses. but also the most powerful, for it says the way towards our ultimate goal... the source of our faith. Yahweh bless. we always were given a choice, but the path Jesus left us to follow is the best choice. Yahweh bless. Indeed, people may never agree on a lot of things. But yes, we came from the same beginning and will finish the same end. Very nice verse, Marri! This is also one of my favorite verses in the Bible. It assures me of God's promise that I have been saved thousand years ago by God's grace and infinite love. I BELIEVE it's the GOSPEL. A very good reflection here, giving a personal insight on a very familiar and mostly quoted Bible Verse.